The Canon EF 75-300mm f/4-5.6 III USM Lens is a relatively small, very light and very cheap lens for this focal length range. And the 75-300 III really is cheap. You usually get what you pay for - unfortunately this is the case with the 75-300 III. Build quality of the Canon EF 75-300mm f/4-5.6 III USM Lens is mediocre (and this may be a generous rating). Lightness is the benefit, but you won't find smooth zoom and focus rings. I wouldn't want to subject the 75-300 III to a lot of abuse as I doubt it would survive. Image quality from the Canon EF 75-300mm f/4-5.6 III USM Lens is also mediocre. The 75-300 III is soft wide open at all focal lengths. Sharpness decreases as it zooms from 70mm to 300mm. However, the corners are softest at 70 and getting better by 300. Corner and center softness decrease as the 75-300 III is stopped down. Stopping down a relatively slow lens means a lot of light (or a flash) is necessary for handheld photos. Handholding a slow lens at 300mm requires a lot of light to begin with. A 7-blade aperture is a decent feature for a lens in this price range. 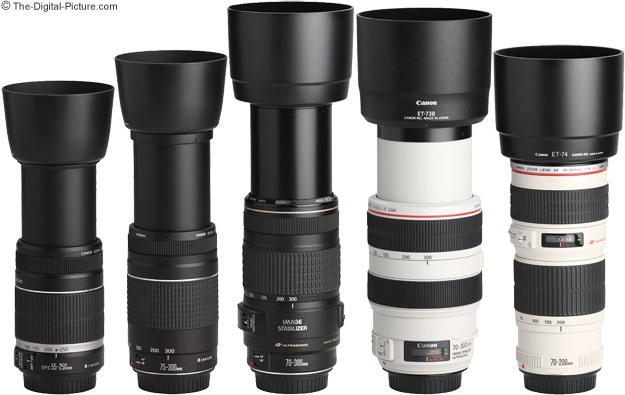 The Canon EF 75-300mm f/4-5.6 III USM Lens is most comparable to the Canon EF 75-300mm f/4-5.6 IS USM Lens. Image quality is very similar between the two. Of course, IS can offset part of the handholding dilemma. The 75-300 III suffers from CA (Chromatic Aberration). Pincushioning is visible at 300mm. Vignetting is well controlled. Focus speed is OK, but not fast. The Canon EF 75-300mm f/4-5.6 III USM Lens is quite small and very light. It extends significantly when zooming to 300mm, but is very easy to carry around. 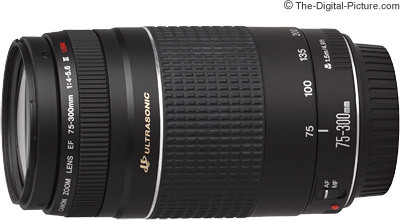 As for the price, I've already said - the Canon EF 75-300mm f/4-5.6 III USM Lens is cheap. This is one of the reasons you might consider this lens. If you can afford no more than this lens, you will be able to capture memories. You might also be interested in this lens if you intend to use it very infrequently. Otherwise, I recommend getting one of the Canon EF 70-200mm L zooms such as the Canon EF 70-200 f/4L Lens. The image and build quality of these lenses are much better. A 70-200 L lens with the Canon Extender 1.4x II resulted in better image quality than the 75-300 III alone. If you care about great image quality and sharp photos, the Canon EF 75-300mm f/4-5.6 III USM Lens is not for you. And Photoshop cannot enhance details that are not there.